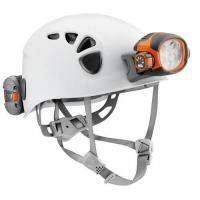 Petzl TRIOS Caving helmet with ultra-powerful lighting, four regulated lighting modes and ACCU 2 ULTRA rechargeable battery The TRIOS helmet is designed for cavers looking for a two-in-one solution that is complete, durable and comfortable. This helmet offers great versatility. It has an ABS shell and a polystyrene liner. Lighting is provided by an ULTRA WIDE headlamp. This headlamp provides ultra-powerful regulated lighting of 300 lumens and a uniform beam for approximately 180°. It has four lighting modes and a reserve mode for when the Lithium Ion battery is almost discharged.